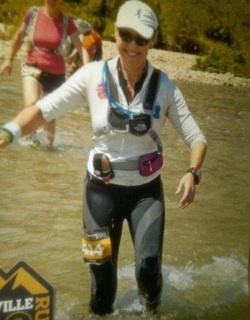 Well done to, Lynne Hewett, 47, class of '03 who recently completed one of the toughest footraces in the world. The La Ultra –" The High". It is a gruelling 222 km race through 2 of the world's highest mountain passes. With an average altitude of 14,765 ft, and reaching up to 17,700 ft at its highest point, competitors have to battle with an oxygen content that is around 66% less than at sea level. La Ultra - The High pushes human endurance to the limit and re-defines what the human body and mind are capable of. Lynne completed a Bachelor of Nursing and Midwifery at CSU and is currently based in New York. In 2006 she competed in the World Ironwoman championship in addition to this she has so far completed over forty marathons and seven 100 mile Ultra marathons. The La Ultra took place through the Himalayas. Starting 11 km outside of Khardung Village, at approx 14,000 ft, the route ascends to an altitude of 17,700 ft (Khardung La) before descending down to 11,483 ft (Leh) then climbing up to an altitude of 17,583 ft (Tanglang La) before the descent to the finish line at 15,000 ft (Morey Plains). With a cumulative vertical ascent of 10,193 ft and descent of 8,873 ft and a temperature range of 46 degrees Celsius, La Ultra – The High is one of the toughest high-altitude ultra-marathon races in the world.